Scientists replaced faulty rods and cones in blind mice with artificial photocells and restored nearly full-color vision. An estimated 39 million people worldwide are blind, and another 245 million suffer from moderately or extremely impaired vision. Retinal diseases like macular degeneration and retinitis pigmentosa slowly rob people of their sight as the rods and cones in the retina gradually atrophy and fail. One of the only hopes for averting total blindness in those cases is to receive a “bionic eye,” a wireless retinal implant that receives electrical signals from a video camera worn on a pair of sunglasses. These bionic devices, while potentially life-changing for people with total vision loss, have some limitations: They can only be implanted in one eye, they require patients to wear a power source and processor at all times, and even the best cases report a very low visual acuity of 20/1200 with no color recognition and few perceptible details. Now a team of Chinese researchers believes it has developed a new type of retinal prosthesis that restores full-color vision without any external power or processors. The implant replaces the malfunctioning layer of rods and cones with artificial photoreceptors made from gold-titania nanowires, according to a paper in Nature Communications. The retina is a thin membrane on the back of the eye that converts incoming light into electrical signals that are then processed by the brain. 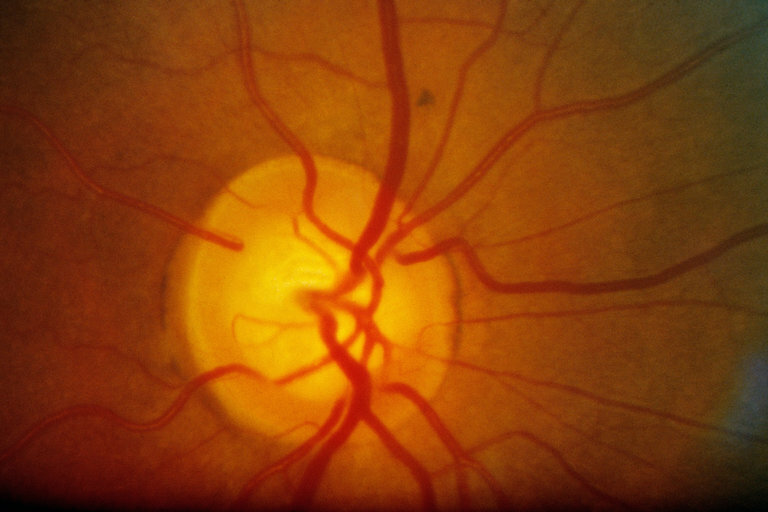 The retina is only half a millimeter thick, but contains three distinct cellular layers. The bottom layer, farthest from the light source, holds the rods and cones, also known as photoreceptor cells. It’s the photoreceptor layer that’s compromised in people with retinal diseases. The top layer of the retina is formed by glial cells, a type of neuron or nerve cell typically found in the brain. It’s the glial cells that capture the electrical impulses from the photoreceptors and channel them through the optic nerve to be processed by the brain into images. Back in the 1980s, scientists discovered that they could bypass the photoreceptor layer entirely and send electrical impulses directly to the glial cells. Since glial cells are usually unaffected in patients with macular degeneration and retinitis pigmentosa, researchers started looking for ways to replace the faulty photoreceptor layer with implanted electrodes. The Argus II Retinal Prosthesis System developed by California-based Second Sight is the current state-of-the-art solution. An external video camera worn on a pair of sunglasses captures images that are sent to a small video-processing unit carried by the patient. The images are translated into electrical signals that are transmitted wirelessly to an electrode array implanted in the back of the eye. The implant broadcasts the electrical signals to the glial cells, which carry them to the brain. The Argus II is marketed as a “humanitarian device,” not a cure for blindness. With lots of training, patients slowly learn to interpret what they’re seeing — flashes of contrasting light and blurry shapes — as familiar faces and objects. But the idea of the implant was never to recover full vision. The Chinese approach seems to offer new hope for people with congenital or degenerative retinal diseases. The idea is to replace the retina’s biological photoreceptors with artificial cells that carry the same innate ability to convert light into electricity. Jiayi Zhang and Gengfeng Zheng at Fudan University in Shanghai developed semiconducting nanowires of titania flecked with gold nanoparticles that replicate the retina’s real photoreceptors in both form and function. In an email, Zhang told Seeker that the nanowires have a pillar structure like rods and cones, and can convert light into electricity without the need of an outside power source. The Chinese research team used the pillar-like nanowires to make a tiny photodiode array that could be implanted directly into the retina of blind mice. To test if the implant successfully restored vision, they implanted a second electrode array in each mouse’s visual cortex to record the electrical signals transmitted from the eye’s glial cells. Five months post-surgery, wrote Zhang, the mice with nanowire retinal implants produced responses in the visual cortex that were similar to wild-type mice with no history of retinal disease. The formerly blind mice perceived green, blue, and near UV light with a spatial resolution of 100 micrometers, although the researchers said that they still needed to improve the response to red light and low-light situations. Further testing of the technology in mice could very well lead to a functional cure in humans for blindness and severe vision loss caused by chronic retinal conditions.